Earlier we released our introductory piece to the 2019 College Football Hour Glass and if you missed that, you can read that here. Today, we boldly go where no man has gone before, as we proudly drop who we think will win the 2020 National Championship and why – months in advance. This is our third straight year to do so, and so far, we have been in the wheel house every year. Not only will we tell you who we think, but why we feel this way and as always, it is numbers driven. In our last piece, we discussed all the criteria we use on building models for every team in college football and today we weed through all of it to give you a national champion. We will get into each piece of criteria we use, as we move into summer, but today let’s cut the fluff. First off, college football is unlike any other sport, in that it really isn’t anyone can win on any given day. Based on our recruiting models, we can cut the teams down to about fifteen that have enough talent to win the national title. From there, we look at coaching and we know, based on those models, we have only about seven coaches in the country that can realistically win the national title. Take Clay Helton at USC for instance; he has a great roster, but has shown, he has zero knowledge of how to make that talent an elite program. Then we look at quarterback play and we can narrow that down to about seven guys in the country who are legitimate national champion signal callers. Finally, we go to our offensive and defensive efficiency models to show us who is and has been playing elite offense and defense over the past several years. 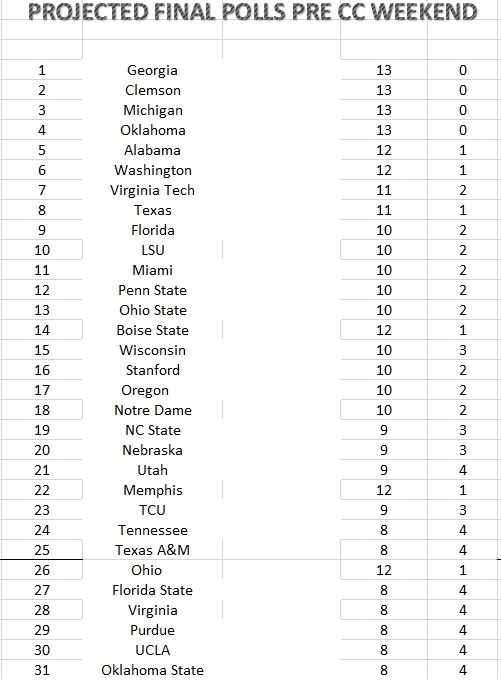 Take all that and we have a final top seven or eight we think has a true legitimate shot at the College Football Playoff. LSU, Florida and Texas are close – really close, but all lack either elite coaching or quarterback play. Texas is a step ahead of both programs at the moment, but by just a bit and a big part of that is playing in the Big12. All three should enjoy great years and a New Years Day Six game this year. Washington has arguably the fourth or fifth best head coach in the game in Chris Peterson and some could argue he is third behind only Dabo and Saban, but they still need to recruit at a higher level to get to where they need to be. They have proven they can make the playoff, and may do so this year, but there is little room for error. Notre Dame, who enjoyed a trip to the College Football Playoff has all the tools to make it back, but trips to Georgia, Michigan and others will probably derail the Irish’s bid at a second straight CFBPO appearance. Ohio State will have to overcome a new coach and quarterback, but history shows us, the Buckeyes will at least have a say in November. That brings us to the final five on our list in Clemson, Georgia, Michigan, Oklahoma and Alabama. For Michigan, it’s now or never for Jim Harbaugh. We have them winning the Big10 in 2019, and punching their playoff ticket behind a great roster, senior quarterback play and a schedule that lends itself to such. Oklahoma has ruled the Big12 and Lincoln Riley has asserted himself as a star in college football. He will again get it done with another transfer quarterback in Jalen Hurts. Clemson is Clemson, and the ACC offers them very little challenge. That brings us back to the SEC, where Alabama and Georgia will again square off for the SEC Championship. These two teams have played back to back thrillers in the National Championship and the SEC Championship; both times Alabama squeaking out victories on literally a play or two or a botched coaching decision or two. Alabama and Georgia both are tops in offensive and defensive scoring efficiency models, tops on talent, and have high end quarterback play. It’s tough to keep knocking an up and coming giant down and right now on our analytics, Alabama would be a touchdown favorite over Georgia – a one possession ball game. But we feel Kirby Smart and veteran quarterback Jake Fromm, have all the tools from front to back to finally knock off Alabama in 2019. Georgia will start more 5-star athletes this fall than anyone in the country. Alabama will be deserving of a playoff berth, but with Clemson, Oklahoma and Michigan likely running the table, Alabama will be on the outside looking in. If one of the other three drop a game, we may see both Alabama and Georgia back in the playoff. Our final four is Clemson, Georgia, Michigan and Oklahoma. Michigan still lacks the offensive consistency though to win the National Title and speed on the edges. Oklahoma should be much improved on defense, but what does that look like? Not good enough to hoist the trophy. Clemson and Georgia will both outlast either opponent and it will again set up an ACC v SEC showdown for the national title. Clemson will be the favorite wall to wall to win the title, but they lost to many guys on defense to replace them all in one year and that will finally show in the playoff. Georgia will be an underdog in this game – 6 to 7 points by our count as you read this today, but the Dogs, who like Clemson have been at the top of almost every statistical category the last two years will play just good enough defensively and be able to score on Clemson enough to outlast Dabo and the Tigers. Georgia has been building for this moment for three years now, and while Kerby Smart has been criticized for some coaching blunders, he is still learning on the job. Everyone has a learning curve, his just happens to be public. Kerby Smart’s rise is very similar to Nick Saban’s at Alabama, in that it took Saban three years to really get the thing up and going. If you remember, it was an SEC Title loss to Florida, followed by a Sugar Bowl Loss to Utah in 2009, then the first title run in 2010, defeating Texas in the BCS Championship Game. The Dogs have arguably the best talent in college football, a rising NFL quarterback in Jake Fromm and a coaching staff that continues to get it done everywhere but the big game - yet. This is their year; Georgia officially enters the college football party and wins a national championship. It’s Georgia – Clemson for all the marbles and this time Kerby gets his hands on the trophy. Our Final Four - plus final top 25. and 130. Conference Primers and individual pieces to come. Final Records prior to Championship Weekend for everyone except those that we have projected to do so. Those games are built in for those competitors as well.